Laikipia District in northern Kenya comprises 10,000 square kilometers (two million acres) of semi-arid grassland and bush savannah. About 60% of the land is commercial cattle ranch, on which wildlife conservation is a primary land use. 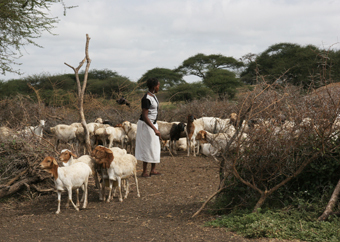 Most of the rest is communal land owned by Laikipiak-Maasai pastoralists who herd goats, sheep and cattle. Both the commercial ranchers and pastoralists use ancient traditional herding systems, developed to protect livestock from predators and cattle rustlers. During the day the cattle are closely tended by herders and at night they are brought into thorn bush enclosures known as ‘bomas’. The Laikipia Predator Project (LPP) is studying the lions here to develop practical measures which encourage coexistence between people, livestock and predators. By understanding how lions, livestock and people are able to coexist in Laikipia, the project is developing strategies for lion conservation applicable to other areas in Africa that do not have any formal wildlife protection. to ensure that local people gain significant economic value from lions and other wildlife, to offset the cost of living with them. 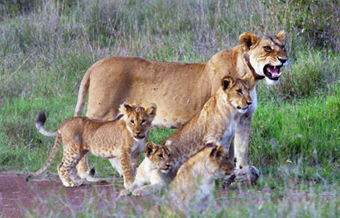 Tracking data has shown that the population of lions in Laikipia is approximately 230. The lions live mainly in small groups, made up of pairs of females and their cubs, with males moving between several groups. LPP has found that some lions are chronic livestock killers, while others rarely, if ever, attack cattle. Whenever an attack occurs, it is usually possible to identify the lion responsible, because of the large number of collared individuals. 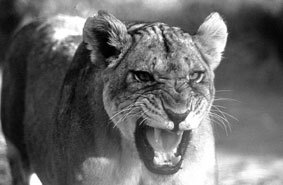 LPP are building a record of the characteristics of lions that become ‘problem animals’ and the conditions under which lions are most likely to prey on livestock. To read a Basque translation of this page click here.